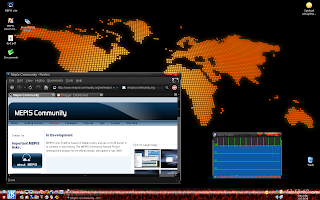 Here is a screenshot of my current Mepis 8 desktop. I am using KDE 3.5 with the Xaphire theme, as mentioned in a previous post. The Kicker background image I created with Blender because I thought the Xaphire one was less than beautiful. I was trying to make something that looked somewhat similar to the Xaphire window buttons. There surely is room for improvement, but it’s a start. I am very impressed with Mepis 8 so far. It has been rock-solid, which is a blessing. Thank you, Warren Woodford!